I arrived back in Australia today and opened an email from younger brother who previously featured with his latest toy at this post. 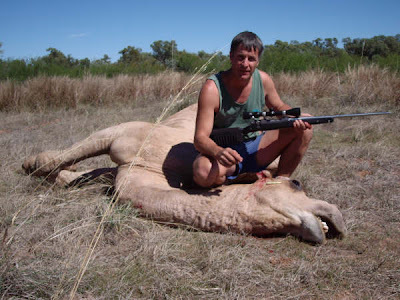 This photo, down from the Northern Territory, shows him with another toy – a Ruger 30-06 in stainless steel. And the end result of messing with that toy – if you are a camel that is. Now a feral pest in Australia these things are also exported to the Middle East, live and in sauce. Did you know Australia has the largest camel population in the world? More Australian camel data than you can eat just here. A photo that is about as far away from London, New York and San Francisco as you can get. A part of me is glad of that. All I have to do is stop talking about going up there and do it.